Draiver’s founder and chief executive is Mashhur Zarif Haque, 38, of Lawrence, Kansas. The $250,000 would come from a state trust fund and be designated for a new company, Draiver LLC of Overland Park, Kansas, just outside Kansas City. The appropriations request was quietly included as part of Florida House Bill 4099, introduced in mid-February to launch a one-time, one-year pilot project to develop the new digital plates. The technology promises to change old-style stamped, state-issued license plates – which Florida began requiring in 1918 – into digital displays that can be used to renew registrations, pay tolls, track vehicle use, warn police when a car is stolen, show customized messages and even display advertisements when a vehicle is parked. Digital plates are already allowed in Arizona, California and Michigan. Each digital plate can cost $700 or more. The proposal circulating in Florida’s Capitol highlights the behind-the-scenes way that some state contracts can be proposed and a lack of due diligence examining the backgrounds of prospective vendors on important government contracts. Draiver’s founder and chief executive is Mashhur Zarif Haque, 38, of Lawrence, Kansas, who was selling new and used cars in that state a decade ago, according to pay stubs submitted in court as part of his federal bankruptcy. He registered Draiver’s website address in June 2017 and started doing business under that company’s name in July, according to internet and state business registration records. The firm formerly was known as DriverDo LLC. It has no apparent real-world experience with digital license plates. The company hires drivers to physically move cars or trucks from one location to another, billing itself as "a self-learning logistics platform that moves vehicles by planning, executing and instructing drivers." Haque owes at least $158,761 in past-due federal taxes, said Brad Solomon, clerk of the Douglas County Register of Deeds in Kansas, where the IRS recorded liens. A U.S. judge in Kansas awarded a lender, Leaf Funding Inc., nearly $104,000 in a 2009 ruling against Haque and another of his companies, Custom Highline Wholesale LLC, after they failed after just six months to make $1,894 monthly payments over a 60-month lease for auto-repair equipment. Haque never appeared in court to contest his debt or explain why he failed to pay the money he owed, legal records showed. In July 2009, after his default civil judgment, Haque filed for federal bankruptcy protection, saying he owed more than 100 creditors millions of dollars he couldn’t pay. His debts included $2 million in business loans; a $1.6 million judgment to Central National Bank from a separate civil lawsuit; $150,500 to the IRS; $50,000 owed on credit cards; $41,000 for his then-fiancée’s engagement ring; and $12,875 to the state of Kansas for unpaid income, sales and payroll taxes. Haque’s wife, Mamie, separately filed for bankruptcy protection in November 2010, saying she owed as many as 49 creditors at least $100,000 she couldn't pay. Central National Bank had sued Haque alleging false pretenses, false representation, actual fraud, embezzlement and larceny, according to court records. It said Haque had acknowledged that his actions were “egregious," and a U.S. judge in May 2011 enforced an earlier judgment against Haque for the $1.6 million by a county district court. Haque also has a trail of apparently abandoned business ventures, according to Kansas business filings. In Kansas, he registered companies called Dooph.com, LaHu, Out2EatSpecials.com, Absolu, Pure, and Pimwimy.com as far back as 2005, but there is no evidence they were ever active. Dooph.com, LaHu and Absolu were included as part of Haque’s federal bankruptcy filing in 2009. Absolu was forfeited in 2008, LaHu in 2010, Dooph.com in 2011 and Pimwimy in 2015, for example, after Haque or his family members failed to update required paperwork in Kansas. Internet records show that Haque has reserved at least 42 website addresses since 2012, including boredboomer.com, mommycab.com, boatdo.com, pilotdo.com, teeniedo.com and truckdo.com. Mommycab.com was associated with the Selection Corp., a high-end, independent car dealership in Lawrence, Kansas, once registered to Haque’s father where Haque said he was general manager until 2015. A dealership spokesman said the family was not affiliated with the company anymore. All but 16 of Haque’s website addresses have already expired, and 10 more were expiring before the end of this month. Another of Haque’s companies, Haque Consulting LLC, is listed as owning a $1 million, 5-bedroom luxury home with a 10-car garage in Lawrence, according to Douglas County property assessor records, but it was unclear whether Haque or his family lives there. Haque created the consulting business in December 2012. It was also not clear how many of Haque's past-due debts he repaid before he was discharged from his bankruptcy case, which was closed in February 2011. The judge in the Central Bank lawsuit declared that $1.6 million judgment to be nondischargeable, meaning it could not be eliminated through a bankruptcy proceeding. Haque declined to discuss his past business dealings in an interview with Fresh Take Florida. Haque stopped answering questions from Fresh Take Florida when a reporter began asking about his financial history. He hung up during a call then did not respond to an email sent to the corporate account where he previously was corresponding about the proposal to give state money to his company. This week, after Fresh Take Florida described results of its investigative reporting and afforded Haque at least 36 hours to choose to respond, his lawyer, Sarmad Khojasteh, declined in a phone call to speak on the record or provide any statement or response for publication. A spokesman for the Department of Highway Safety and Motor Vehicles, Beth Frady, said the agency has never worked with Draiver. So, how did a little-known company in Kansas become the proposed recipient of $250,000 in public money in Florida? Draiver on Jan. 10 hired Clarence "Chip" Case, a prominent lobbyist with Capitol Advocates LLC in Tallahassee. Case declined to say in an interview with Fresh Take Florida how much Draiver was paying Capitol Advocates, and the mandatory lobbying compensation reports covering that period will not be publicly available until after May 15. Case said he conducted a criminal background check on Haque, which found no issues, but missed references to the civil lawsuits against him, tax lien, past-due bills or Haque’s federal bankruptcy. Case said he began researching potential vendors to develop digital license plates and solicited Draiver’s business, after a bill last year mentioned the technology but included no money. About two weeks after Case began representing Draiver, on Jan. 26, Case contributed $500 to the 2020 re-election campaign for Rep. Jackie Toledo, R-Tampa. Toledo has raised $55,608 toward that race so far. The $500 check for Toledo was one of four political contributions from Case to Republicans in recent weeks. Toledo introduced the bill proposing to pay $250,000 to Haque weeks later, on Feb. 15. Case said he approached several lawmakers, and Toledo agreed to sponsor the measure. 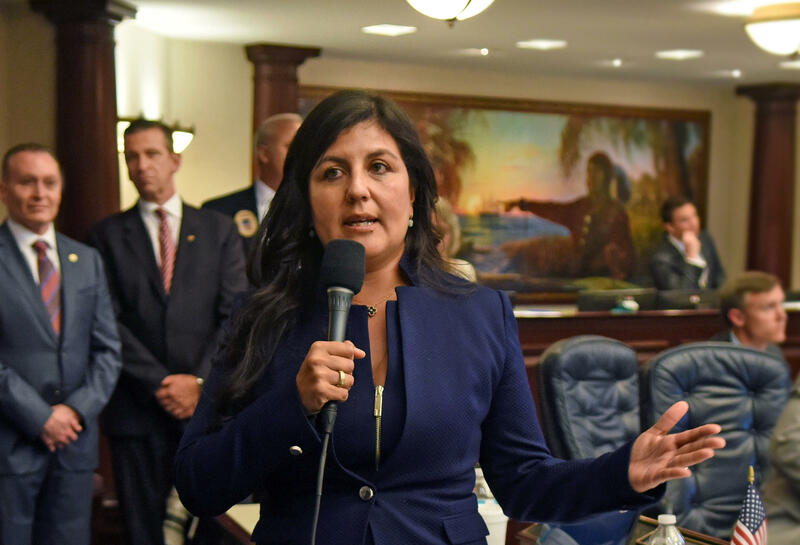 Jackie Toledo in the Florida House. Toledo said in a statement she was hopeful the technology will save taxpayers money. She did not address why she agreed to propose $250,000 in state money to Draiver or whether she knew about Haque’s financial problems. “Digital license plate technology has promise of more efficient tracking of state vehicles and could lead to overall savings for Florida taxpayers,” she said. “My goal in filing this appropriations was to start the discussion on using new technologies through a pilot program with Department of Highway Safety." Toledo is vice chairwoman of the House Rules Committee, who was comfortably re-elected in November to her second term. In her 2018 re-election, Toledo outraised her opponent $419,540 to $84,479. She was previously majority deputy whip. She represents South Tampa on the city's Interbay Peninsula, including the upscale Hyde Park neighborhood. Additionally, Case's wife, Kimberly, is a lobbyist and senior policy adviser at the prominent law and lobbying firm Holland & Knight in Tallahassee, and she is treasurer of the group's political committee. The PAC gave Toledo $500 each in December 2017 and October 2018, and the firm and its PAC donated tens of thousands more to other prominent Republicans in Florida, including $50,000 to the campaigns of Gov. Ron DeSantis and $80,000 to campaigns of Attorney General Ashley Moody. Kimberly Case did not respond to two emails and two phone calls over four days seeking comment. A spokeswoman for Holland & Knight, Olivia Hoch, declined to comment on the record. After Toledo introduced the bill, it was sent to the House Appropriations Committee and a transportation appropriations subcommittee. It has not advanced since March 5. Money for digital license plates is not included in the state budgets the Senate or House voted to propose, suggesting the plan is effectively dead already this year, but the bill hasn’t formally been withdrawn. Haque was in Florida as recently as the last week of March to discuss the digital license plate legislation, said Kathy Zapp, Draiver’s director of risk management, during an interview at the company’s offices in Kansas. Zapp said Draiver approached government officials in Kansas with a similar proposal on digital license plates, but officials turned down the company. Haque filed most recently last year for a federal patent involving a narrow use of digital license plates. It covers instances when a rental customer who borrows a car would display his own digital tag during the time he was driving it, and the tag would go blank when the rental period was complete. Draiver rents two small offices in a commercial building on College Boulevard in Overland Park, just southwest of Kansas City. On the day a reporter visited earlier this month, two people were seated together at a desk in one office and Zapp, who was identified as the office manager, was alone in the other office. Draiver’s predecessor, DriverDo, appeared to be financially stable, said Andrew Johns of Kansas City, who worked for seven months until October 2016 as a data analyst there. He told Fresh Take Florida he worked directly with Haque. “In my experience with him he was very successful in the endeavors that he undertook,” Johns said in a phone interview. Draiver currently relocates cars for large companies such as Penske, General Motors and Budget. Randolph Ryerson, director of corporate communications for Penske, said Draiver has been moving trucks for them for about two years and the company was pleased with the service.